When events happen that shock us, sadden us and make us generally quite depressed, it is heartening to find a way to channel those feelings into assistance. 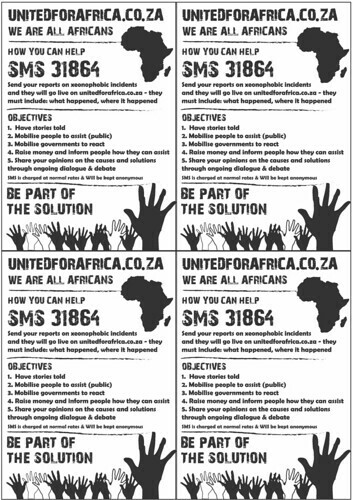 United For Africa uses the Ushahidi engine, and they’ve populated the ‘How to Help’ and the Donation sections of the site. So when you read reports that make your heart sink, you can make a difference. Most of the links on the ‘How to Help’ page are for local donation/assistance centers, though for the online/diaspora folks, you can donate online to the South African Red Cross Society using your credit card. 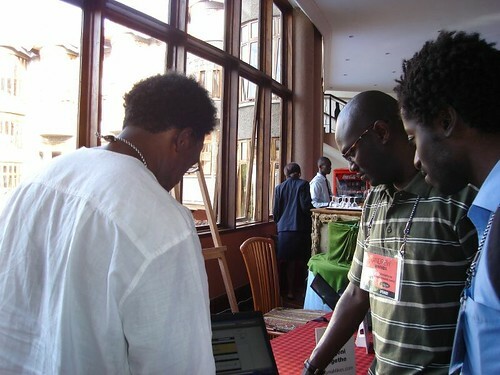 crossposted on the Ushahidi Blog. During the month of March we appealed for your help with Ushahidi’s entry into the N2Y3 Mashup challenge. It is with your support that we are delighted to announce Ushahidi’s participation in the last phase of the mapping challenge. We could not have made it without you and we sincerely Thank each and every one of you for your votes, your encouragement and most of all for your ideas. David and Erik will be going to San Fransisco next weekend to participate in development sessions with other technical experts, product managers, and engineers. It will be a great opportunity for Ushahidi to get some funding towards further development of the Mashup. Wish them luck would ya? For now, we just wanted to thank you again for your support. A big part of Ushahidi is your participation, and with that, we are looking forward to making this project an even bigger success. **More updates will be posted on the Ushahidi blog and also on the NetSquared blog. Ushahidi also has a twitter channel http://twitter.com/ushahidi for bite-sized updates. This piece of news via the TED blog is terribly worrisome. Andrew Mwenda, arguably Africa’s most refreshing intellectual and journalist, has been arrested by Ugandan officials. More here. This is utter injustice, and i am not even sure where to begin. For now, highlighting it on this blog seems to be one way, please highlight it on yours too, and I am sure some initiatives and online campaigns are being organized. Keep an eye on the TED blog for Updates. Below is a picture i took of him last year at TEDGlobal. He is the one in the middle with glasses,looking at the Mamamikes remittance site, and speaking with Segeni. Please text incident reports to 6007, kindly include the location where you are texting from. The information will appear on Ushahidi.com. Kindly pass this along to everyone in Kenya, particularly in the rural areas. By and large coverage of the situation in Nairobi is extensive, but we need information from the rest of Kenya as well. Thank you for your support. Just a note of thanks to all the African bloggers who joined in Blog Action day. I learned so much from all the posts, and i hope you find something in the globalvoices roundup that resonates with you. I write this having just heard that the editor of this newspaper, Mondli Makhanya, and its head of investigations, Jocelyn Maker, will be arrested this week. Their crime is that they published a story alleging that the Minister of Health, Dr Manto Tshabalala- Msimang, screamed at hospital staff and drank huge amounts of booze while in hospital for a shoulder operation. The minister, the custodian of our nationâ? ?s health, has denied none of these allegations. This newspaper also published allegations that Tshabalala- Msimang was a drunk and a thief. This story has not been refuted by the minister nor any other government official. A Jaiku channel has been set up with updates on this developing story. You can read more about it here. I am not that much of a politico 😉 but I realize the important link between democracy and free press. Being from Kenya where there’s always a tussle between the govt and the press, I can totally empathize with our fellow Africans in SA, and truly hope this gets sorted without members of the press being thrown in jail. Plus, bloggers are an opinionated bunch just like journalists, if they arrest a journalist one day, what’s to prevent govt’s from arresting bloggers? Capetown is using solar powered traffic lights to buttress it from expected power cuts. As Rory points out, its a great start to making solar power more commonplace. I would love to see pictures of the traffic lights…this is a blatant hint to our South African friends at WebAddicts. Implementation of solar tech such as this makes so much sense, here’s hoping more countries see the example and follow suit. Just imagine a whole street in (_______insert African country of your choice) with solar powered streetlights. Warms your heart yeah? In case you have not heard, Dr. Ngozi Okonjo Iweala has been appointed as managing director of the world bank! For brevity’s sake, i will just say that her appointment is laudable, in part because it signals a new direction for the world bank and how it views developing countries. Please watch the talk she gave at TED Global in Arusha to see how she tied together the issues of aid, trade and African self-determinism. I hope she will be given a chance to reshape the terms of world bank’s relationship to the developing world in a way that is beneficial to Africa, and continues to shape Africa’s next chapter “A healthy, smiling, beautiful Africa”. Speaking of the world bank and its policies in Africa, according to the Guardian, the world bank is accused of razing congo forests, thereby endangering the pygmies. I feel a bit bad using the word pygmy, because they have names that I would much rather use such as ‘The Lega’. Several years ago i went to the Nelson Atkins museum in Kansas city for an exhibition named ‘The Art of the Lega’. It was an eye opener for me because the explanations for the pieces gave me a glimpse into their society. One of the tenets i remember was the idea of peace as a fabric of society; the Lega people have a pacifist culture which was expressed in the way they chose to fashion tools – with smooth edges, eschewing sharp points. Since that exhibition and when reading stories about the Congo war and its adverse effects on the people there, I wonder if we need to rethink how we address a community that we know little about other than their stature. Stepping back to the story about the world bank making recommendations to the DRC govt about industrial logging being beneficial to the DRC, did anyone listen to the local community about how best the forest can be used to truly benefit people? For more on Art of the Lega, the companion book to the exhibition is available on Amazon.